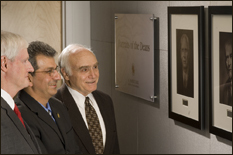 From left to right: Former dean and outgoing provost William Destler, outgoing dean Nariman Farvardin and Herbert Rabin, interim dean as of July 1. Herbert Rabin, associate dean of the Clark School, director of the Maryland Technology Enterprise Institute (MTECH), and professor of electrical and computer engineering, has been named interim Clark School dean, pending completion of a national search for a new dean. Rabin will become interim dean on July 1, when the Clark School's current dean, Nariman Farvardin, assumes the UM provost position. Farvardin replaces former Clark School dean William Destler, who will become president of the Rochester Institute for Technology. This will be Rabin's second term in this capacity. He was previously interim dean at the Clark School in 1999 and 2000, just after Provost William Destler stepped down as dean of the Clark School and before Nariman Farvardin was named. "Herb served with great skill and resourcefulness in that period, as I?m sure he will do now," Destler said. "It is greatly reassuring that this crucial transitional role will be filled by someone so respected and well liked within the school, the university and the engineering and business communities. Certainly, there can be no one better prepared for the job." Rabin served as deputy assistant secretary of the Navy for research, applied and space technology from 1979-83, and before that in a number of positions at the Naval Research Laboratory, the last of which was associate director of research with responsibility for space programs. His degrees are in physics (B.S. from the University of Wisconsin, M.S. from the University of Illinois, and Ph.D. from the University of Maryland). He is a fellow of several professional societies including the American Physical Society, Optical Society of America, the American Association for the Advancement of Science and the American Institute of Aeronautics and Astronautics. In addition to his work on a number of space science and technology programs, he has conducted research in the study of defect structure in solids and in nonlinear optics. Rabin has been the recipient of majors awards, including the Department of Defense Distinguished Civilian Service Award. He has served on numerous federal and state advisory boards, panels and studies. He has been active as a consultant to industry and as a member of corporate boards of directors.